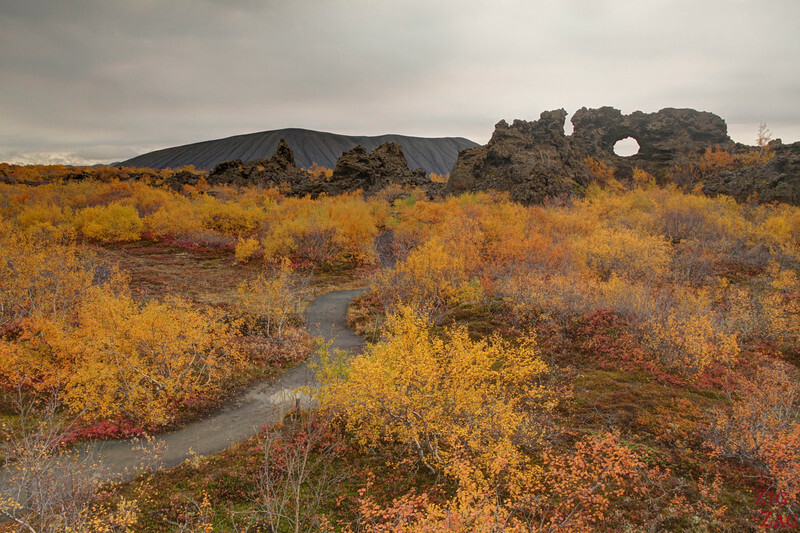 Hverfjall, Iceland is one of the best preserved circular volcanic craters in the world! 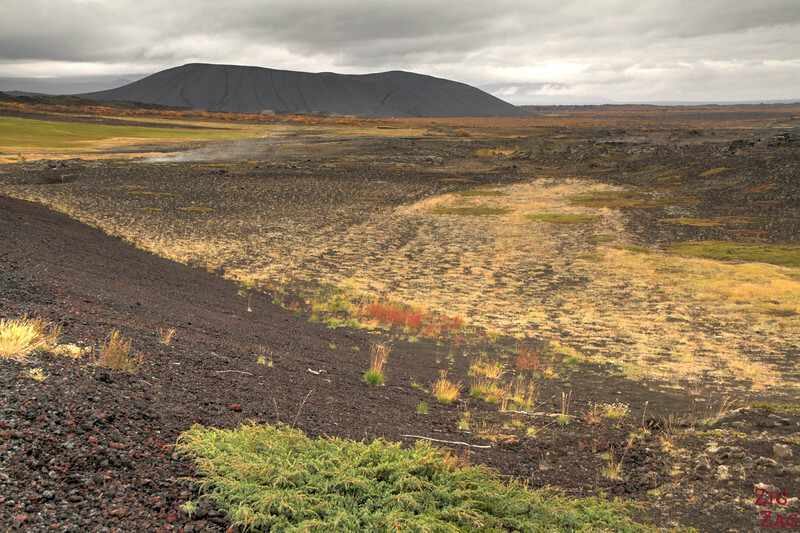 Also known as Hverfell or Myvatn volcano, it is an icon of the Lake Myvatn area. 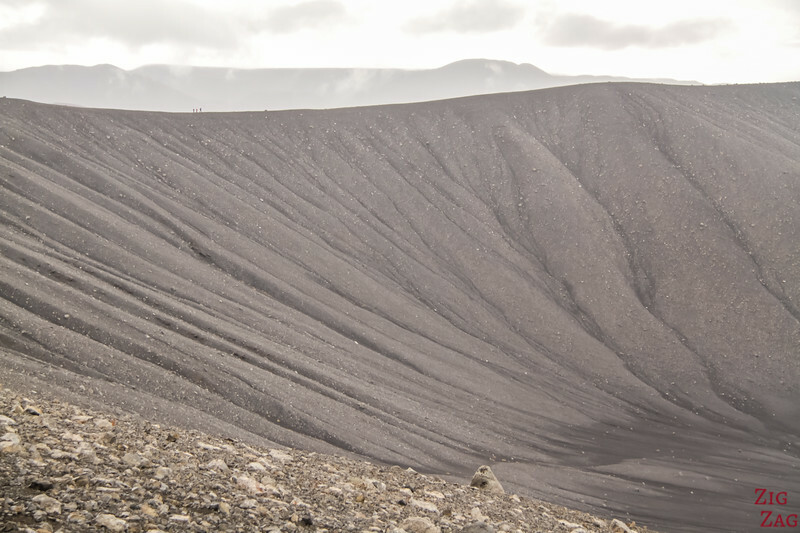 The crater is the result of a volcanic eruption, a bare bump in the landscape. 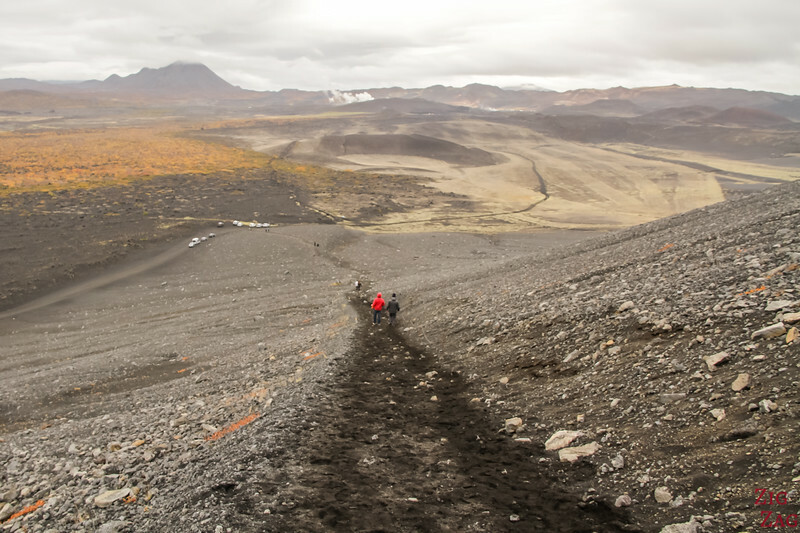 The Hverfjall hike takes you up to the rim and offers magnificent views alla round. Below is my guide to help you plan your visit. 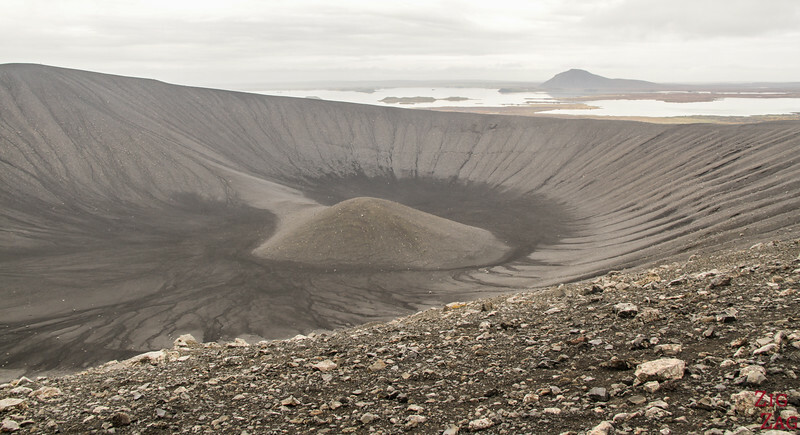 Hverfjall is an explosion crater near lake Myvatn in North Iceland. It is about 140 meters deep and 1km in diameter which makes it one of the largest of its kind in the world. It is not perfectly round (probably because of a landslide in the south part during the eruption) but it is still stunning! 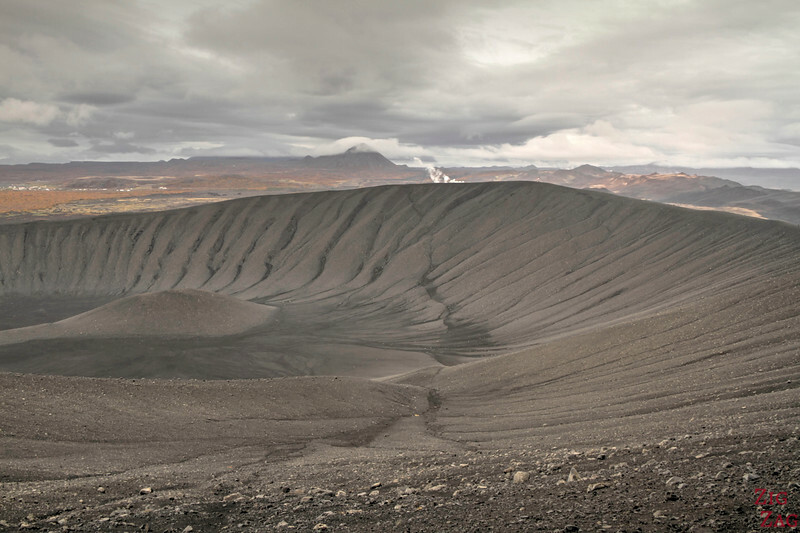 Some prefer the Viti crater, with its lake and colors but the scale of Hverfjall is definitively more impressive. And I really enjoyed seeing the bottom of it. 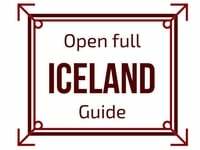 You can easily spot it around Lake Myvatn in Northern Iceland, and I selected it as part of my top 5 things to do in Myvatn which also include Dimmuborgir and Skutustadagigar. 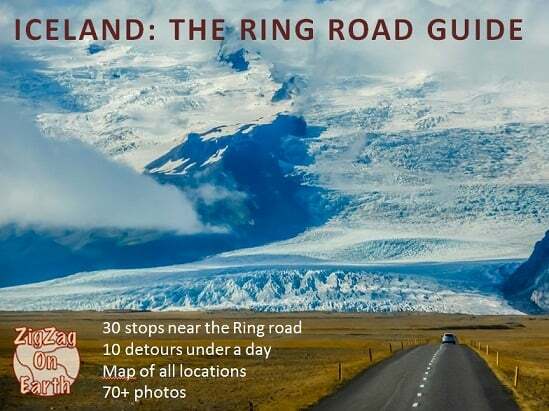 On the road along the South of Myvatn lake, you will find a turn away from the lake towards the crater, where Hverfjall is indicated. It is just 5 min drive on a gravel road and you will reach a parking at its foot. Wear good footwear and bring layers to protect yourself of the changing weather. 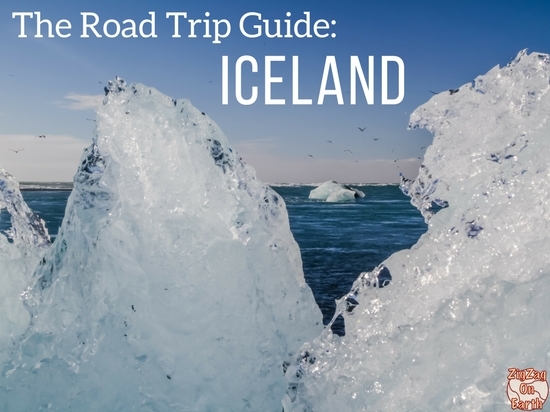 Check out my guide on what to pack for Iceland. Walking poles would be helpful especially in winter. 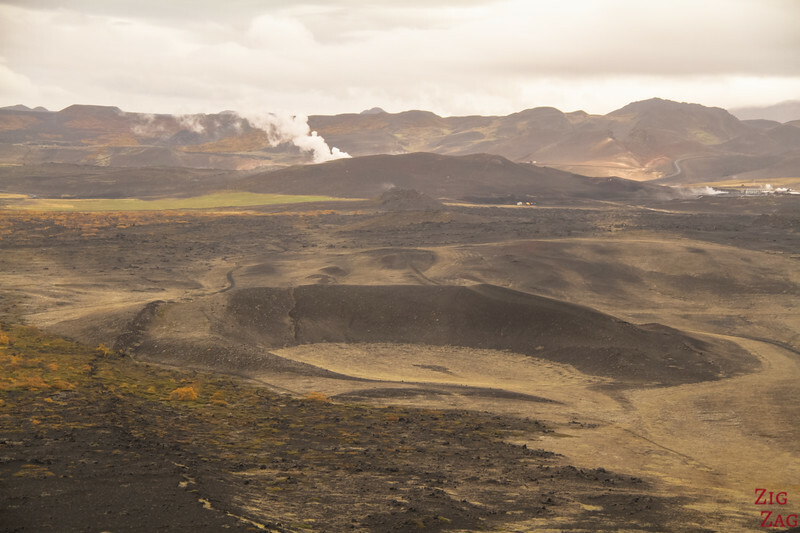 Hverfjall can be seen from many roads around Lake Myvatn. From far away it does not look like much of a climb but it is. And you can see on the pictures below how bare it is. 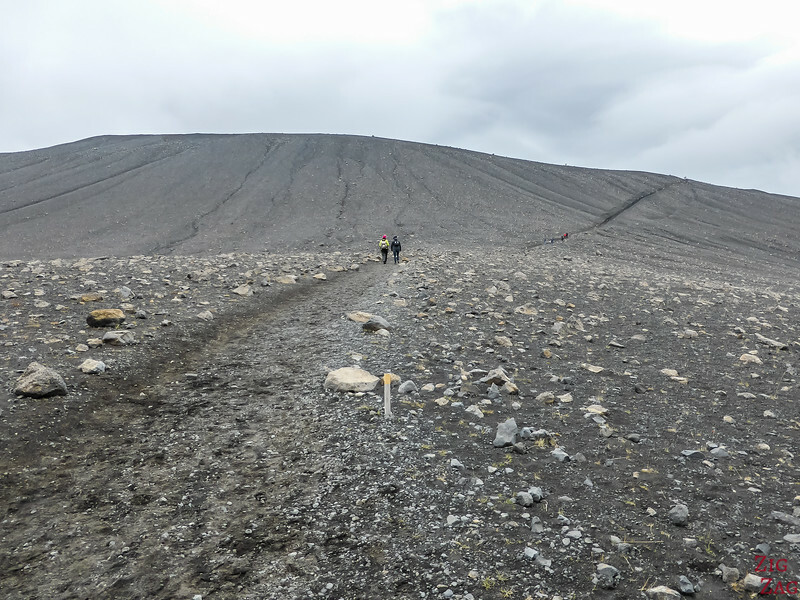 For those wondering if they will be able to climb Hverfjall, how difficult it is, here is my take: It is definitely a challenging walk to the top. The path from the parking is the easiest one. I was overweight and not in shape but I managed to climb it in 15 min. I just took my time, let the others pass me and stopped whenever I needed. The path is wide enough to stop and let others continue. And think of the reward: the incredible scenery at the top and the bonus: less flies! 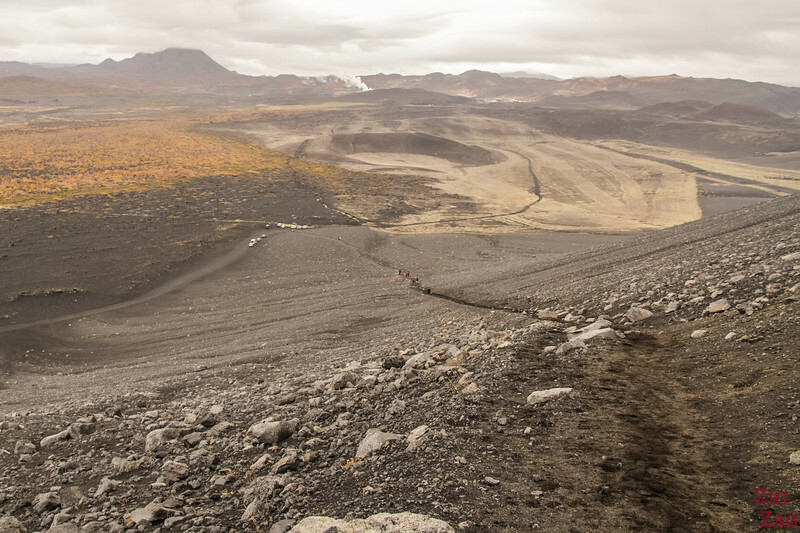 Here are pictures to show you the path to climb Hverfjall from the foot and on the path. And here is the reward, once you reach the rim and walk around you get incredible views of this crater. I walked slowly all the way around it and it took me 1h30. Some sections go up and down but the rim is large and if the wind is not too strong you feel safe. I was amazed by the huge rocks that are still lying around. Rocks that were shot from the inside of the crater 2 500 years ago! In photos things often look smaller. So have a look at the pictures below and see the size of people compared to the crater. Seeing the inside of the volcano is not the only reason you should climb on the rim. From up there, you have nice views of Lake Myvatn and the area. 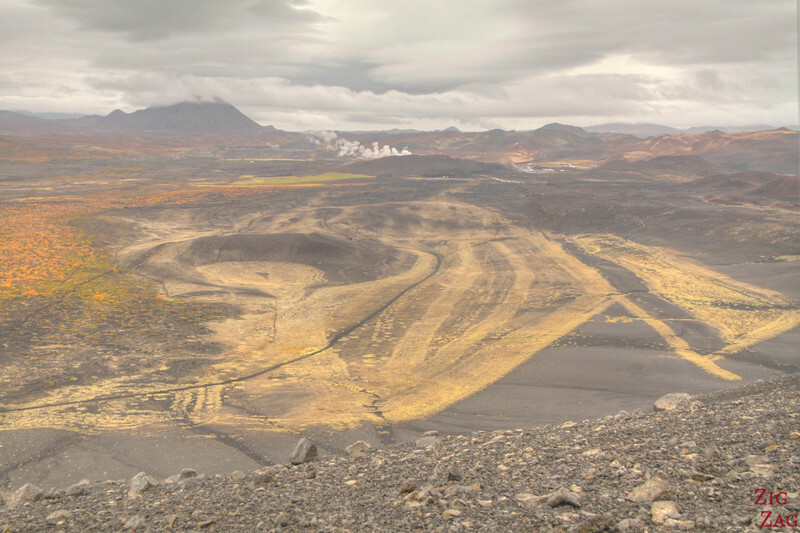 Have you ever climbed a volcanic crater? Claire – beautiful pics !! Thank you for all the extra details ! I have been to the area 5 or 6 times and have not found the parking lot. 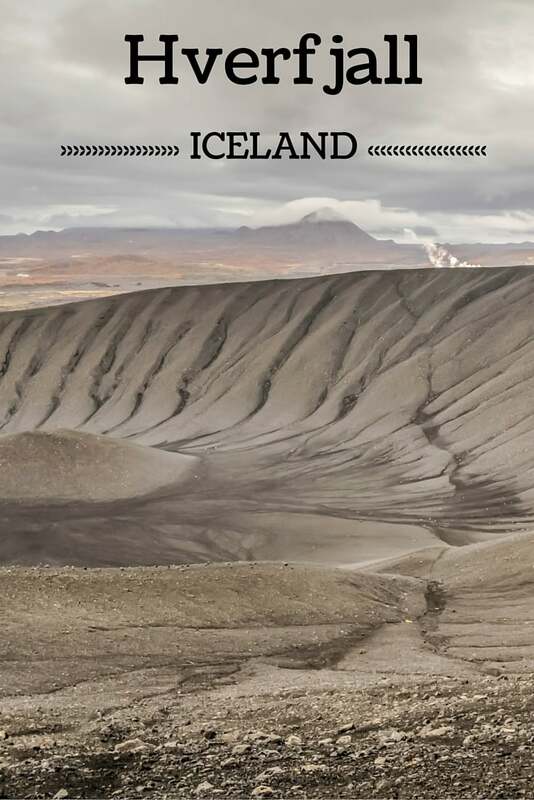 My wife and I are returning to Iceland again this summer and will try again. Hopefully your pics will help. The hike looks more difficult from a distance. Thank you for the info. I just hiked it. I found the parking lot no problem, I was coming from the south though so that might make a difference. On 848 after the entrance to dimmuborgir (which is also fabulous) keep driving north and very shortly you will see a sign for hverfjall. You cannot see the parking area from the road. 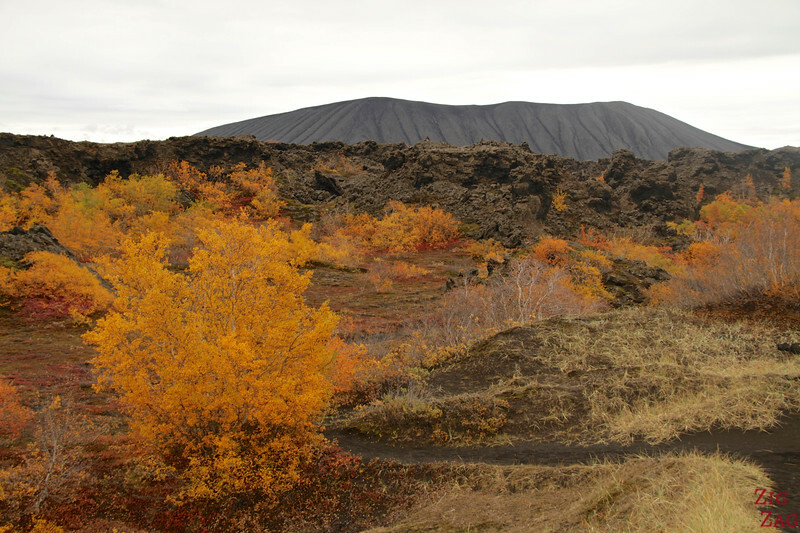 Follow the packed black silt road around and you’ll find to the parking lot near the base of the crater. There a nice building there with WCs as well. Enjoy! !